I can't believe I couldn't get either of my children to join me for this super fun activity--fuddy duddies! 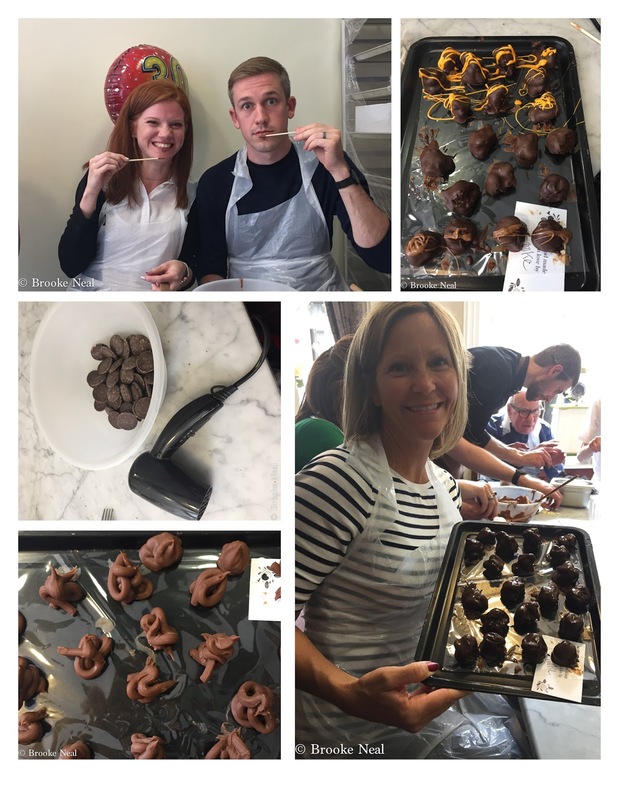 While in York we passed the Cocoa House offering a number of classes and the truffle making class was the only one that fit into our schedule, so I ditched my family for a couple of hours one afternoon to try my hand at chocolateering. First, we melted our chocolate with a hair dryer. It is a little more forgiving in a classroom setting as you can't really melt the chocolate too fast. Second, there isn't a whole lot that goes into truffles, it was like chocolate chips, vanilla and cream. Third, Those poo shapes blobs are what we rolled into balls for dipping. I've since read of a more efficient way of getting a ball, but in a classroom setting this worked fine. Fourth, before dipping truffles in chocolate, the melted chocolate must cool down just a bit. It is ready when you can touch your bottom lip and it doesn't burn. If you find yourself in York this is a fun activity and very (or should have been) family friendly. How fun! Can't believe your daughters didn't want to make chocolates!